The learning was real and authentic. Student teachers from across sixth grade stepped up to research and present materials gleaned through collaborating and critically thinking information about 9/11. 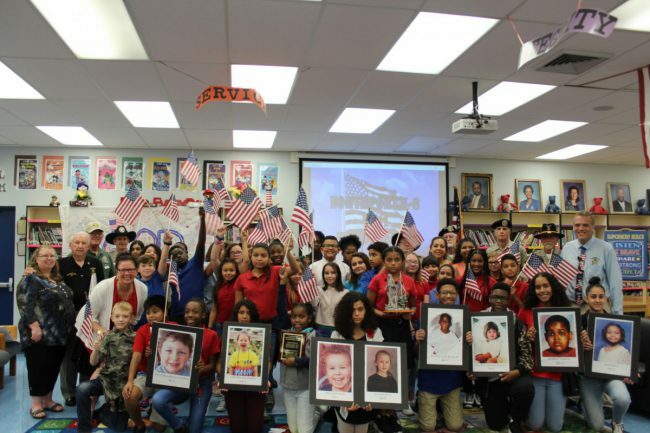 The Northport Media Center is officially the “The Northport K-8 School 9/11 Children’s Memorial Library” and the children today learned why we remember the eight children who perished. Many thank to Vietnam Veterans, Chapter 566 and Veteran, Bill Arnold. Also thank you to teachers, Allison Barajas, Elissa Garcia, Elisabet Flores, Mindi Slater and Debra Allen for their assistance with student work and projects. The program came together in a beautiful flourish and we definitely paid solemn tribute to the nearly three thousand lives lost on 9/11 as well as to the eight children who perished. Student teachers who presented lessons were Hannah Glerum, Juline Calixte, Maddison Cassano, Ciara Alcantara, Destiny Perry, Kayla Jean Baptiste, Victoria Gallway, Samerria Monfleury, Brian Lira, Degan LaFary, Omarion Lexine, Shayne Ledford, sixth grade Northstar students and Upper level Drama students under the direction of Mrs. Barajas. Special thanks to Sandra Tyndale who sang a stunning rendition of the song “Blessings” by Laura Story and John McIntosh from our community partnership with Step Up America, A Call to Good Citizenship. Thanks to every student and teacher who helped make our program one for the history books in the field of educating children.